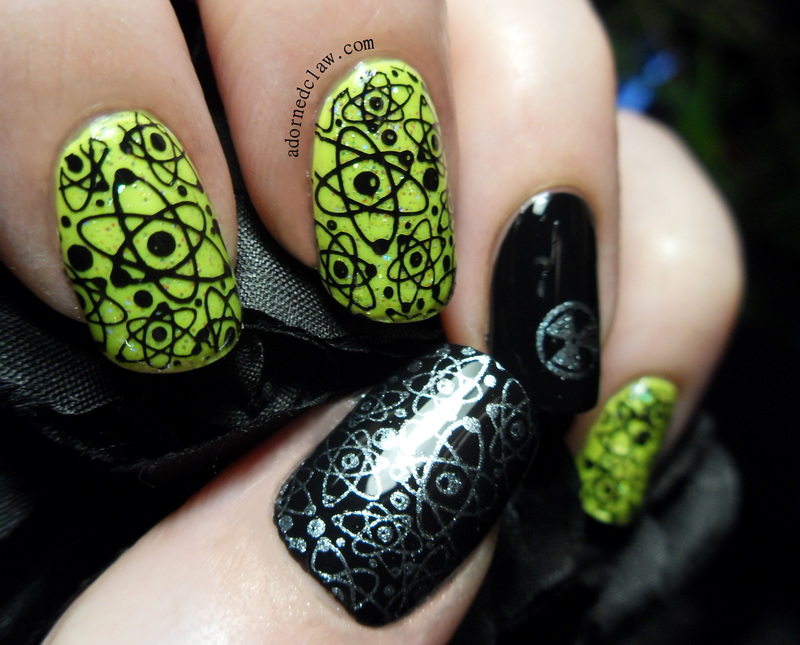 On my other fingers I added a coat of French White from Nina Pro with two coats of Barry M Acid Yellow over the top, I used the coat of white polish to make the yellow really glow! When that was all dry I topped it off with a coat of Barielle Shades Stardust for some sparkles and then and then a thin layer of topcoat. 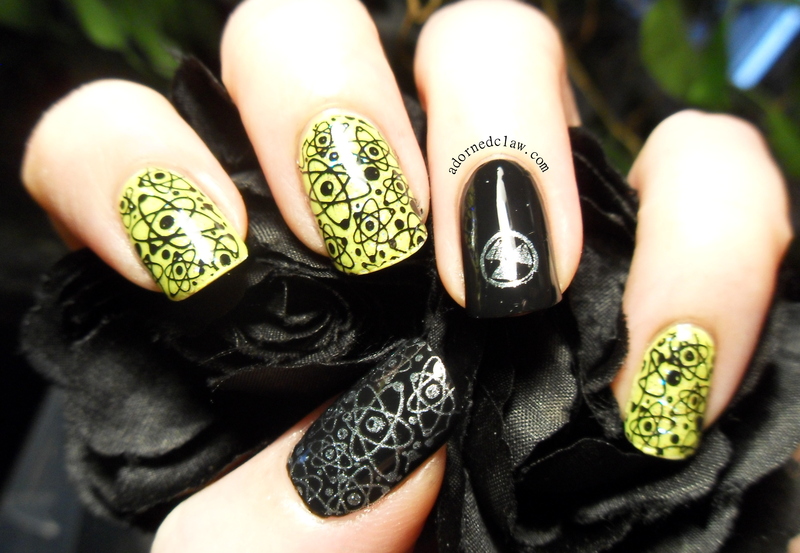 For the stamping I used Barielle Shades night moves for the silver and Konad Special Stamping Polish in Black for the images over the yellow. 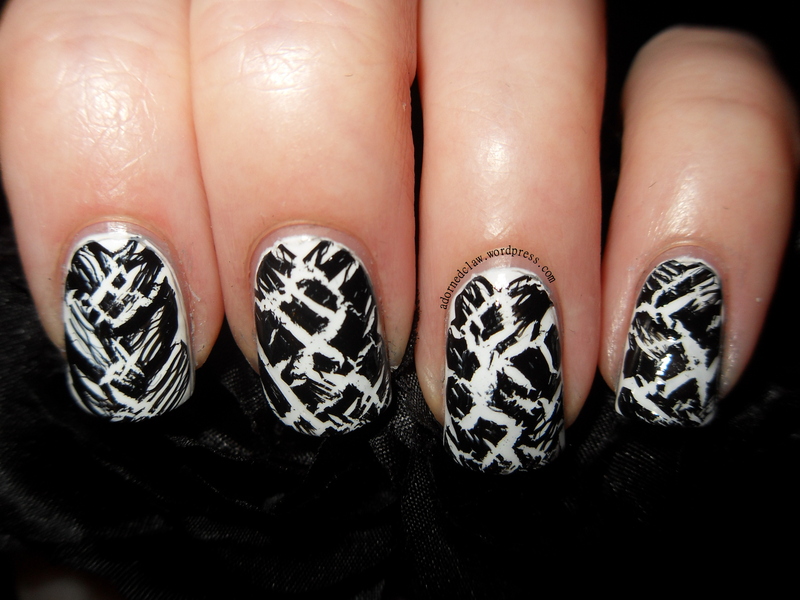 Crackle Polish Experiment Part 2! I have to say, I really like this Layered look, I started with two coats of Black Magic from Revlon, then one coat of Silver Shatter from OPI, then a coat of SV. I am definitely going to be using this layering technique again! The silver base colour is Night Moves from Barielle shades, then I added one coat of Super Bass Shatter from OPI, then a coat of 60 second fast dry top coat from color club. 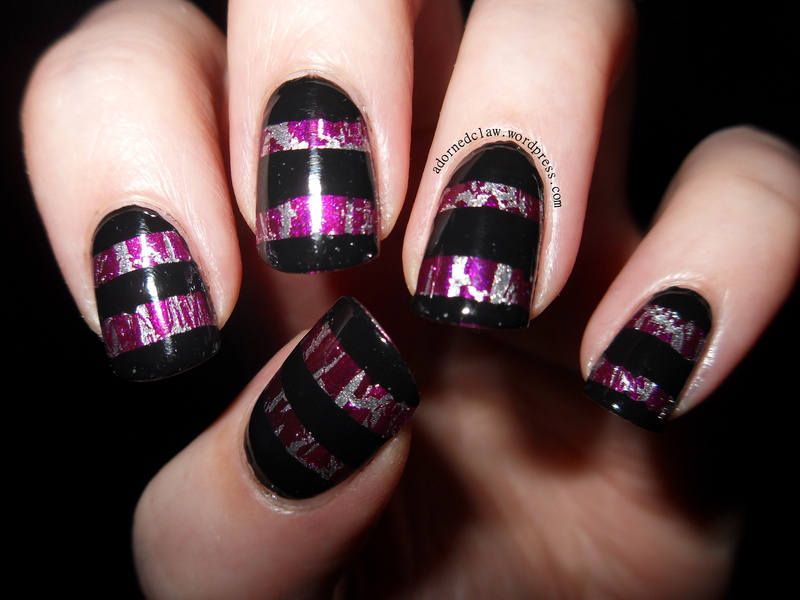 I used tape to mask off the stripes then Black Magic from Revlon, after removing the tape I applied another layer of topcoat. I think that this may look better with thinner stripes (and a bit more care than I used while cutting the tape) I did find that the black polish peeled up with the tape which I found a little odd, as I took the tape off while the black polish was still wet. I think it has something to do with the topcoat. 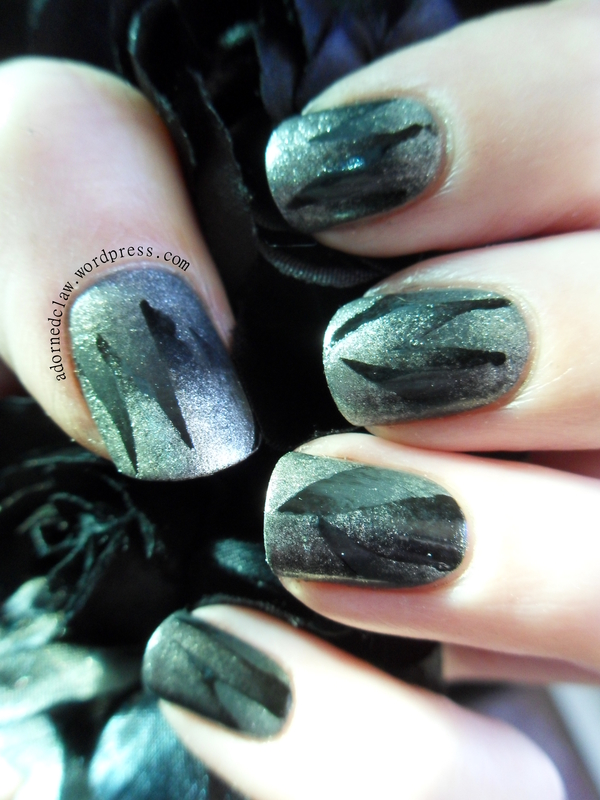 The base colour is Black Magic, the tip is OPI Silver Shatter. 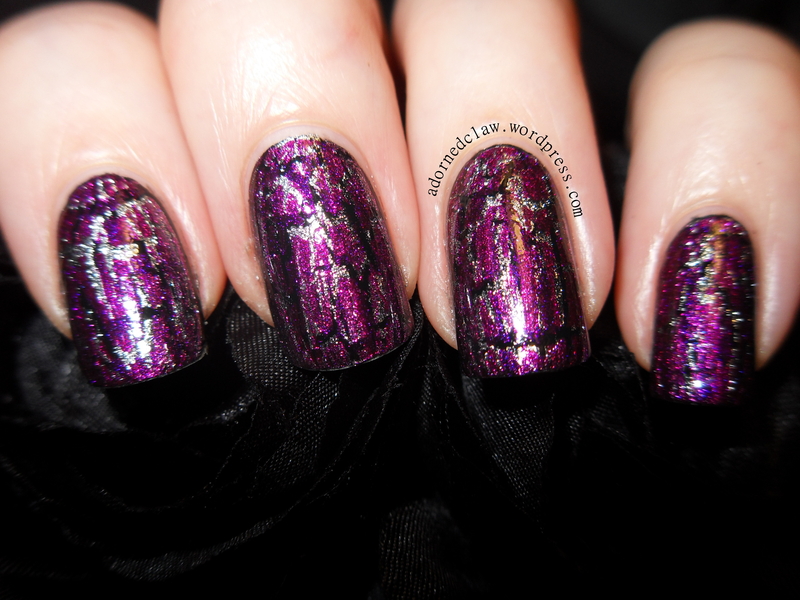 I’m not really the biggest fan of crackle polishes and somehow I have collected 11 bottles of the stuff! So I decided that I should actually have a play with them rather than leaving them to gather dust! 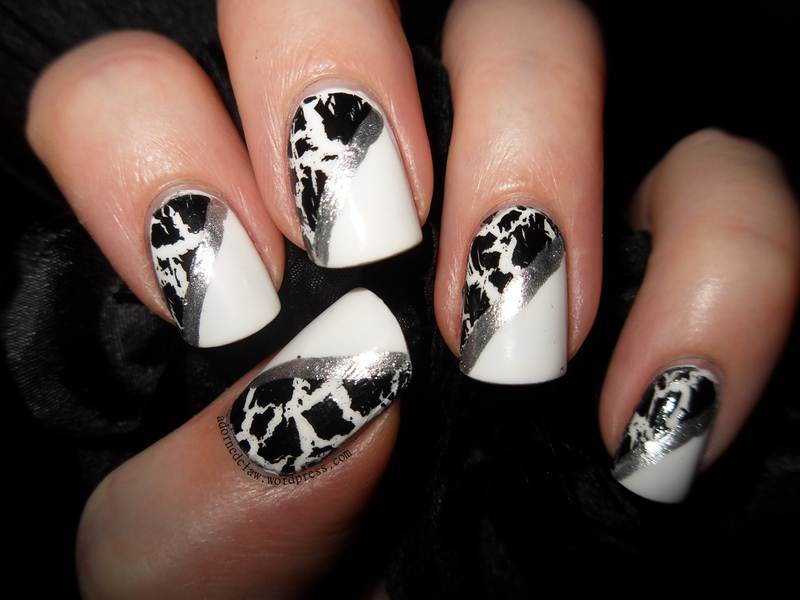 I chose Nina Ultra Pro in French White for the base colour and Black Shatter from OPI. 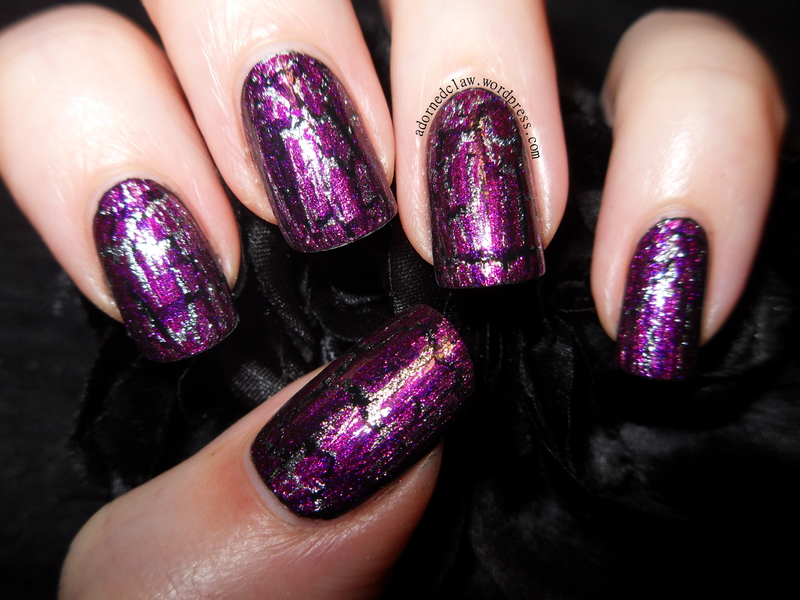 This is one coat of shatter polish, The OPI seems a lot more ‘crackly’ than some of my other shatter polishes, it shows more of the base colour, and it dries to be rather textured, this took two coats of top coat to smooth it out! 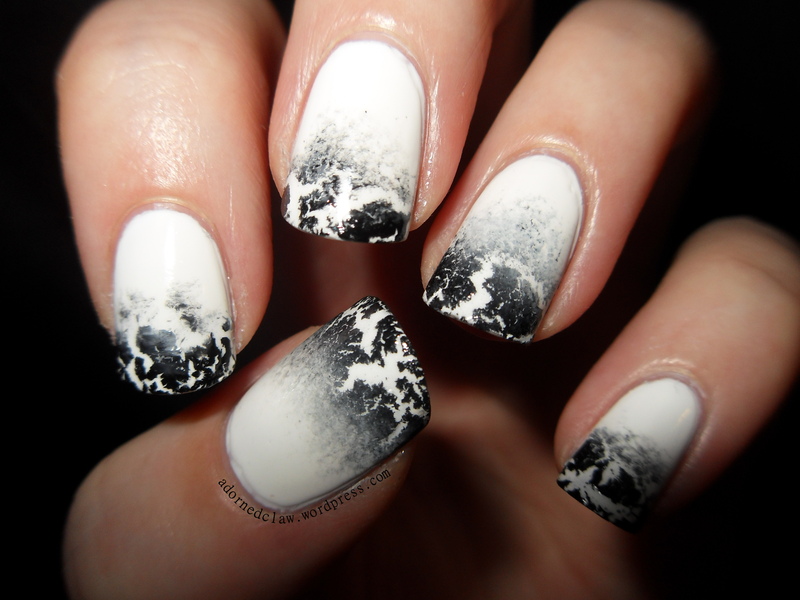 With brush strokes in different directions, (like braided nails but with one colour) the crackle effect is more controllable, and gives a much more even effect! I was really surprised at actually liking this, 🙂 I think it will look much better in different colours, perhaps silver and black or red with gold crackle polish for something a bit mote festive! But in black and white it looks like lightning! After a busy day yesterday I now have a Facebook Page and a page on Google+ 😀 Setting those up took rather a lot longer than I thought, so I ended up not having enough time to write anything after doing these cute silver owls! 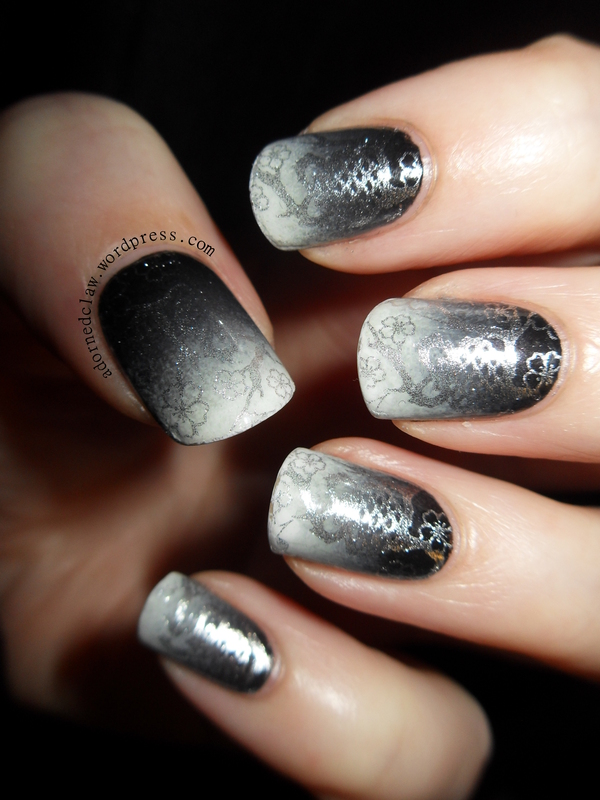 For this I started with a sponged gradient of Revlon – Black Magic, Maybelline – Couture Grey, Sally Hansen – Pumice and Nina Ultra Pro – French White. 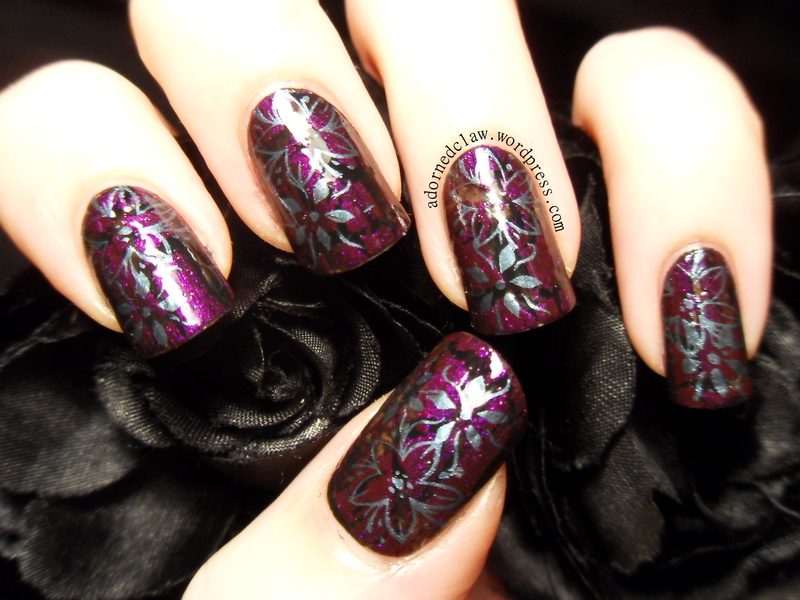 For the stamping I used Moyou Suki Collection 01 with Barielle shades Night Moves and finished it off with a coat of Color Club 60 second topcoat. I used the same part of the Moyou plate for the Glitter owls in my first post! This was a nightmare to photograph, my poor camera was absolutely hating it, unfortunately the photographs don’t show all of the detail 😦 so you’ll have to take my word on how amazing this looks lol! 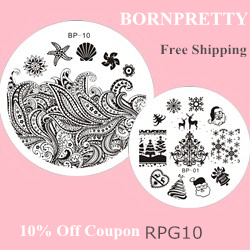 I to start with I thought that I would be able to keep up with my blog posts but after I stuck tissue to my face with wet nail polish while sneezing I thought it would be best to leave it for a bit Lol! 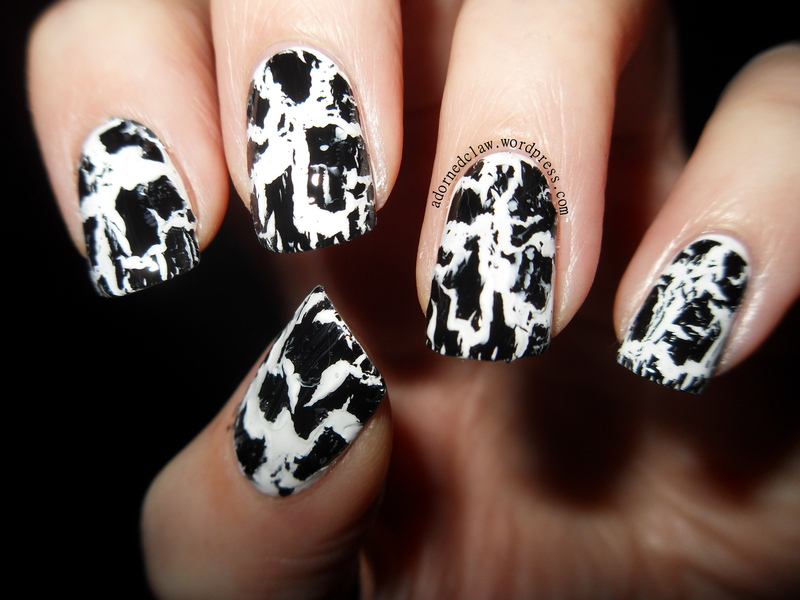 For this I used two coats of Ivory Skull from Sally Hansen (I love the name of this polish so much). 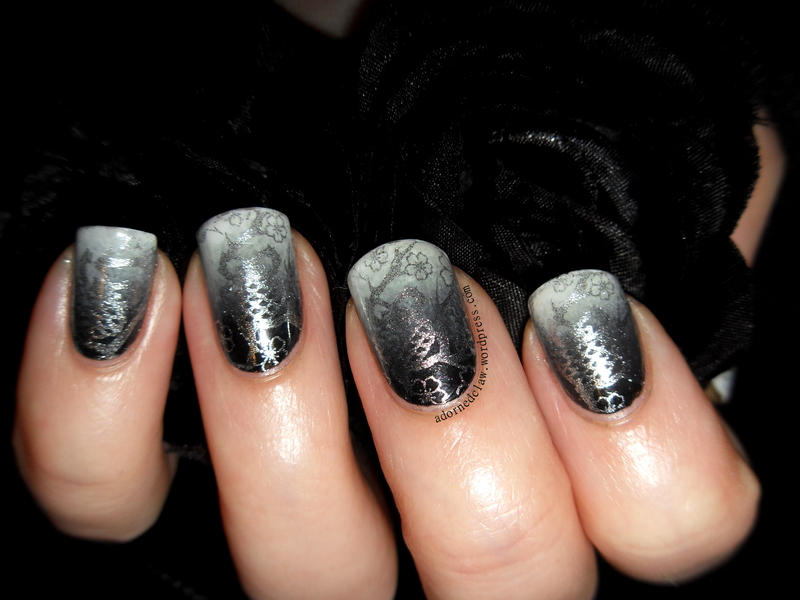 Then I used a sponge to add some patches of Couture Grey from Maybelline and Night Moves from Barielle Shades. 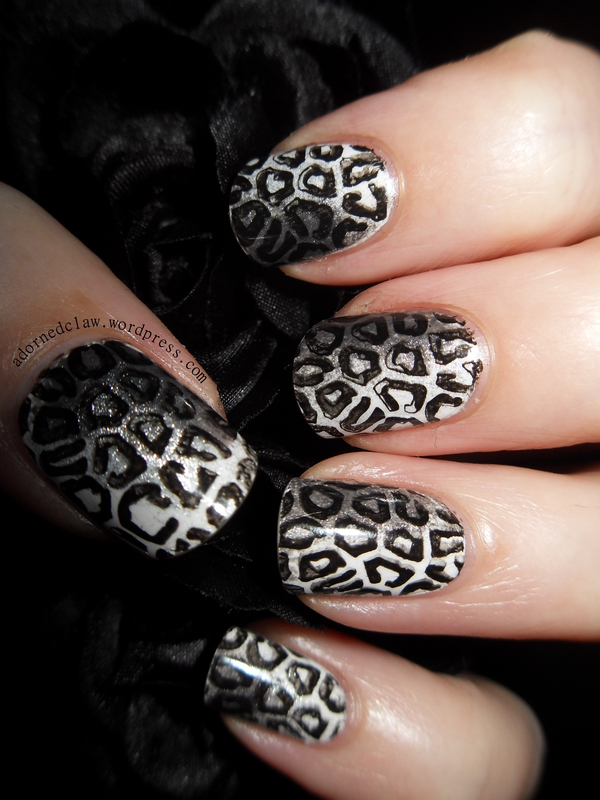 For the stamping I used Black Magic from Revlon.